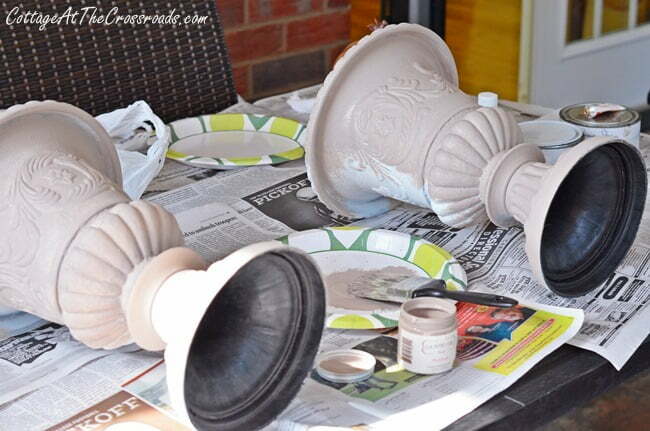 A few weeks ago, my sister-in-law Jean asked me to help her paint some cheap, plastic urns that she was planning to use on her fall mantel. 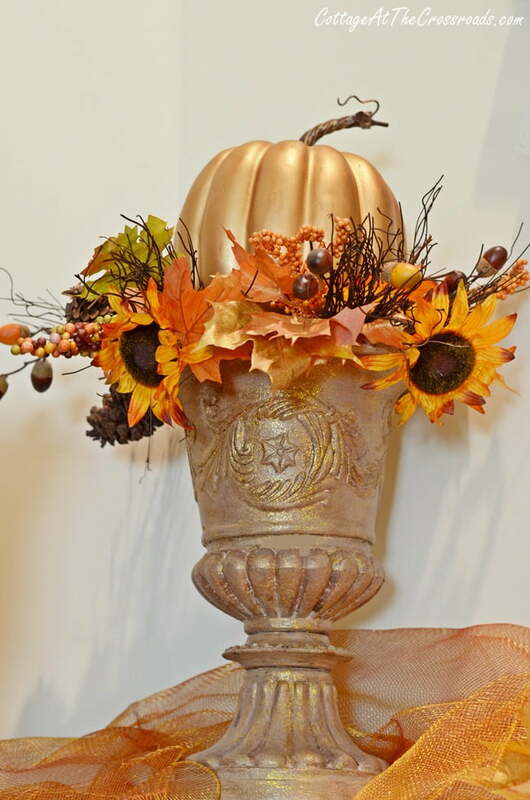 And I’ll have to say that the painted urns on the fall mantel look fantastic! It always amazes me what just a little paint can do. 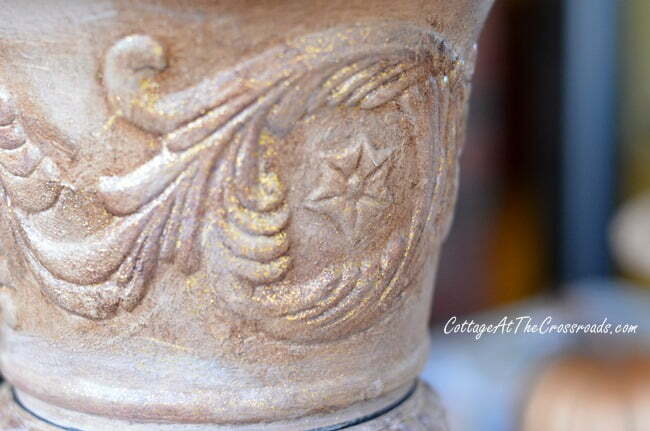 The urns originally were dark brown and came from a discount store. Jean didn’t pay much for them. The first thing she did was spray paint them white to cover the ugly, dark brown color. So this is what they looked like when I got to Jean’s house, and I actually thought they looked good painted white. But Jean has one of those sunburst mirrors on the wall above her mantel, and the white urn didn’t look good with it at all. 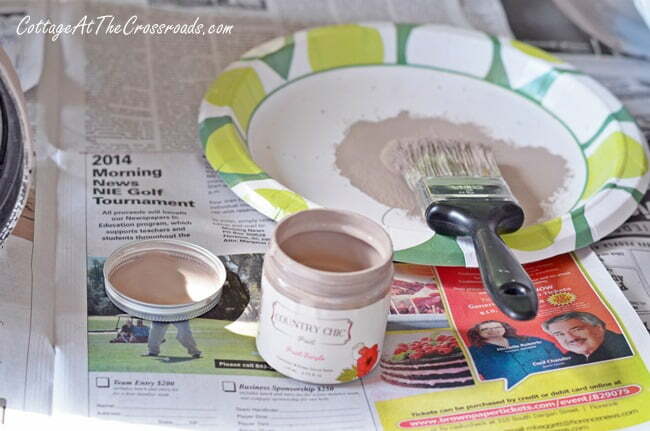 So I whipped out this sample pot of some Country Chic chalk paint that I had gotten recently and proceeded to cover the white. Such a pretty, neutral color and they were looking better already. You can see how dark the urns were in this photo. 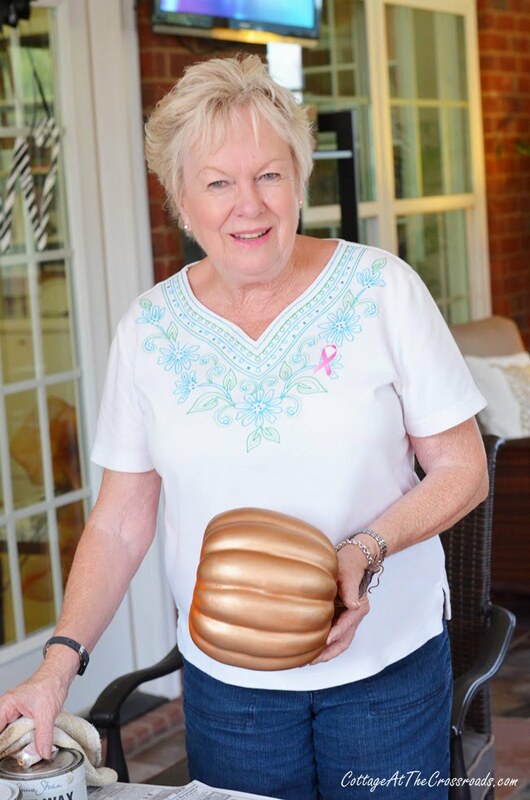 While I was painting the urns, Jean was rubbing some antique gold Rub n’ Buff on the orange pumpkins. 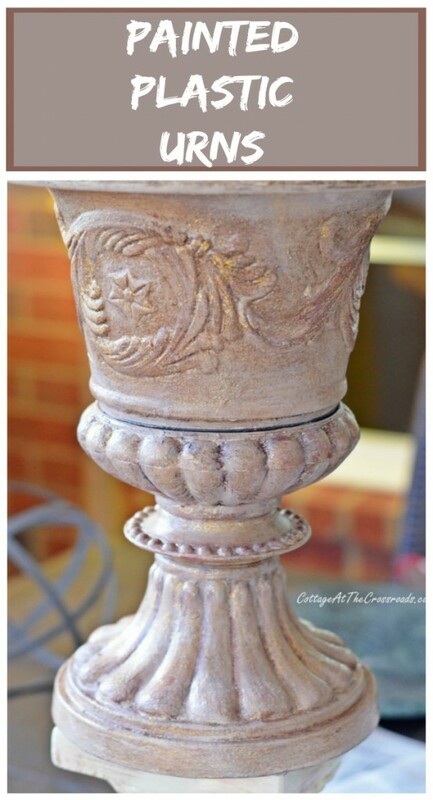 The urns have some pretty details on them so to highlight them, I mixed some Annie Sloan clear wax with the dark wax and pushed the wax into the crevices. Then we allowed that to dry overnight. The next day I thought the urns needed just a little bit more highlighting, so I painted the details with some sparkly, metallic paint called Gold Rush. Oh, my! That was exactly what the urns needed to go with that gorgeous mirror that Jean has! 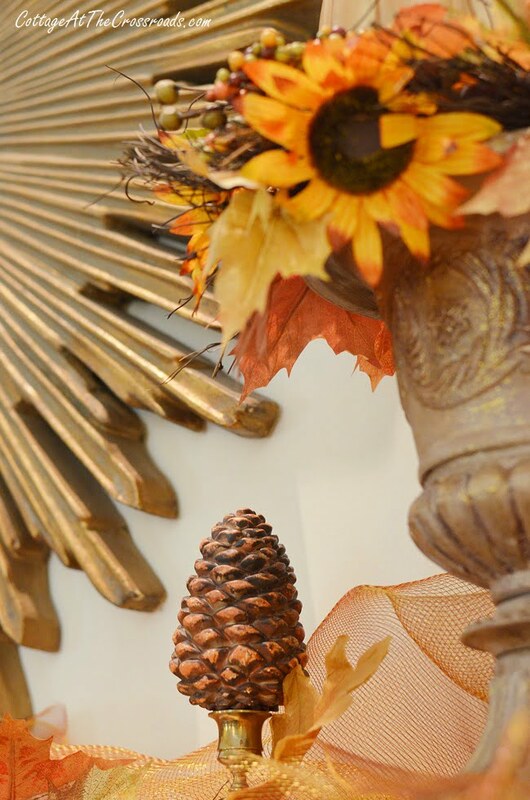 Here you can see where she’s used them on her fall mantel along with this pine cone candle on a brass candlestick! 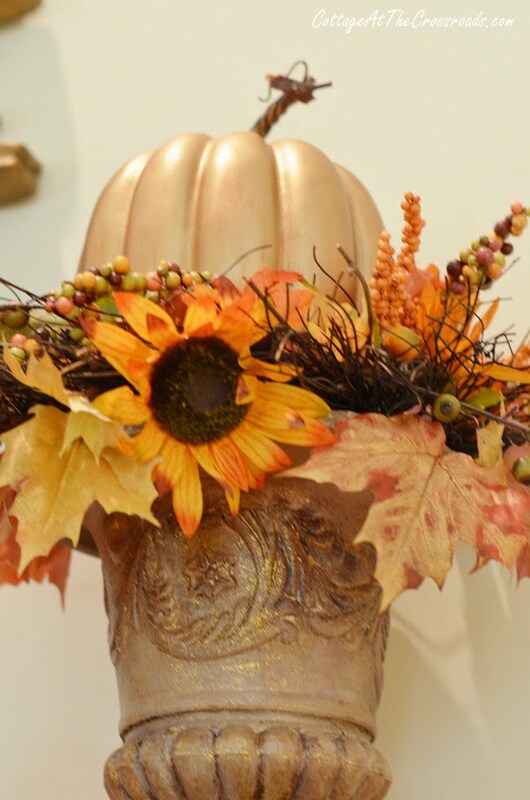 Look how pretty the antique gold pumpkin looks with the fall leaves and flowers and the urn! 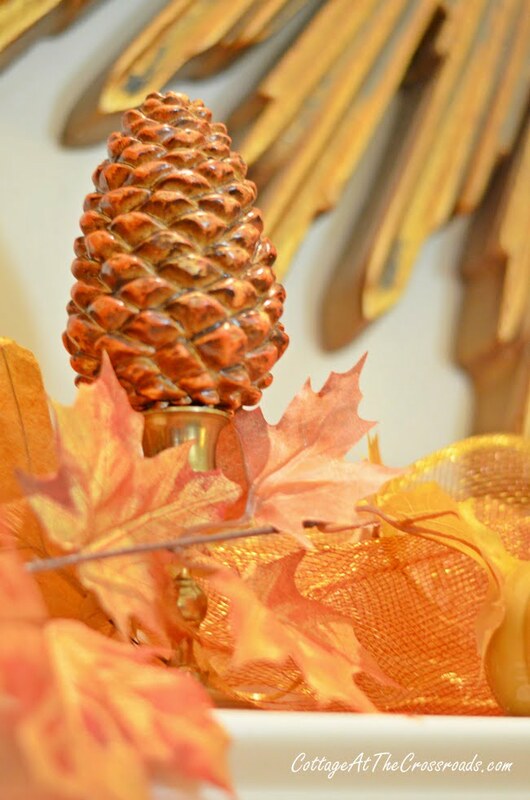 All the colors are just magical together on her fall mantel. 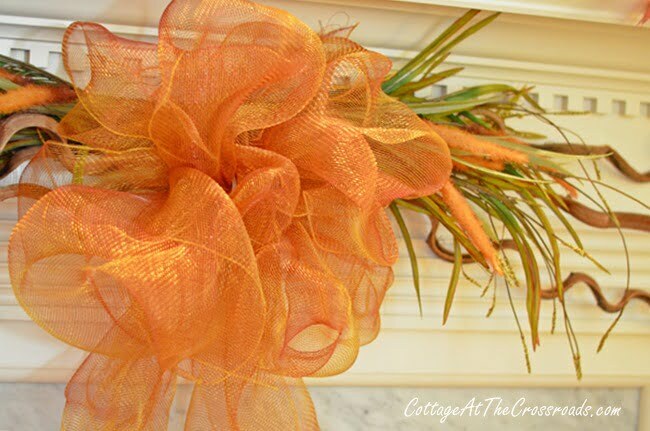 She added this orange mesh bow here and placed more of the mesh on the top of the mantel. 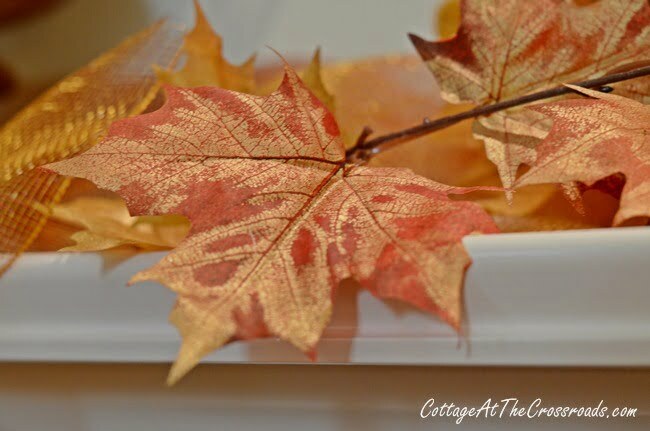 These are some metallic leaves that we found at Michael’s that go perfectly with the other colors. Her fall mantel is so pretty I just can’t stop looking at it whenever I go over to her house. So glad I was able to help transform the urns into these pretty things that are the feature of her mantel. 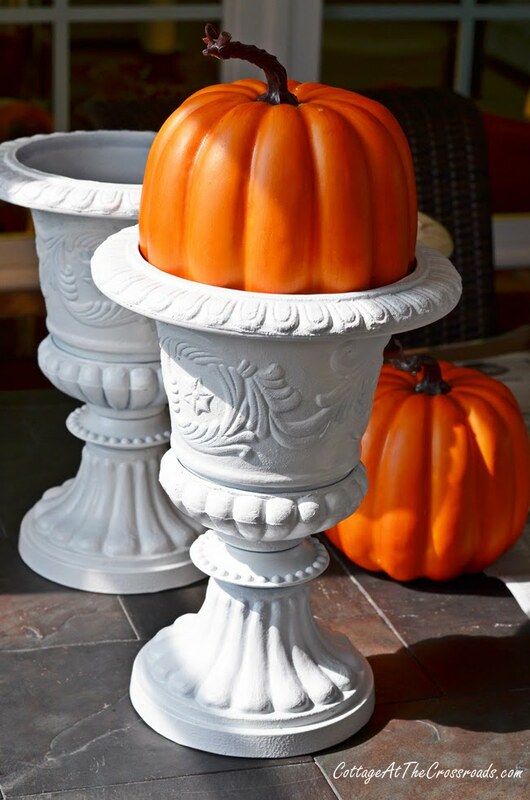 You would never have known that they started out as some cheap, plastic brown urns unless I’d told you, would you? So when you see some at a bargain price, don’t turn them down! 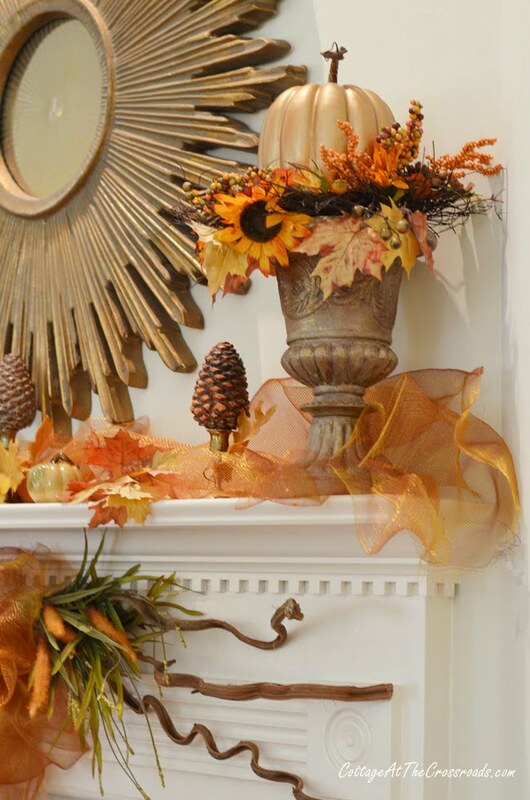 Because look how pretty they are on Jean’s fall mantel. Now that is what my Mom would have called making a silk purse out of a sow’s ear! Fantastic job! Jane, you and Jean did wonders to those urns. Rub’n Buff is amazing and so easy to use! It’s a lovely ideal for mantel decorations! It is absolutely beautiful. 2 very talented ladies. Why we never think of painting some things amazes me. Like plastic plant containers and urns. These look great! Thanks for telling us how you did it. Thank GOD for you creative people, I love this idea, keep them coming. Can’t wait to see what you do for CHRISTmas. Roseann. Oh, how pretty! You’re right, I would have never guessed they were plastic. The mantel is lovely. Boy,that was really a change,great job. have a great weekend. It really is very beautiful! The certainly don’t look like plastic now. They look very rich and stunning. You two are a dynamic duo for sure! 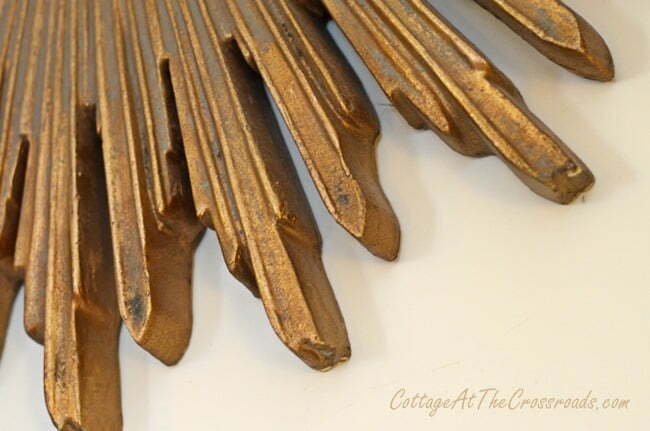 This mantel is stunning and I love that you played off the gold mirror. Amazing transformation but very budget friendly. Perfect. This is a beautiful mantel. Ya’ll did a great job! 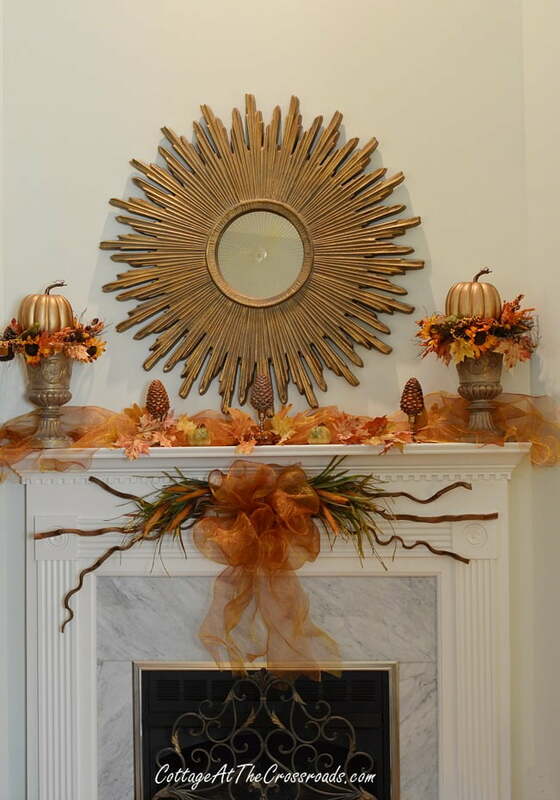 That was a great team effort that resulted in a beautiful fall mantel!